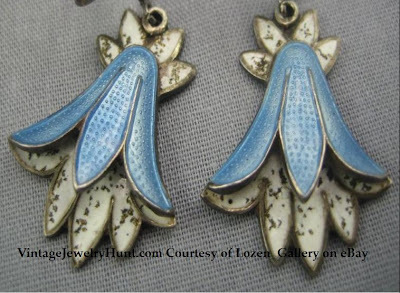 Margo de Taxco silver jewelry is highly collectible, and the enameled pieces are to die for! As they say, we can't have everything in life, and this Margot de Taxco silver enameled floral bracelet and earrings demi parure, was on my wish list. (Wow, that sentence was a mouthful - lol). I desired to acquire this set, but was unable to splurge this time around. For me, the next best thing is to be able to enjoy the images of the sets I'm unable to acquire, and I would like to share this set with you. If you're a fan or collector of vintage jewelry, I'm sure you would agree that the next best thing to having the actual set is to be able to at least view the eye candy from these vintage beauties! These images are here by prior authorization and courtesy of the eBay seller, who sold the set. 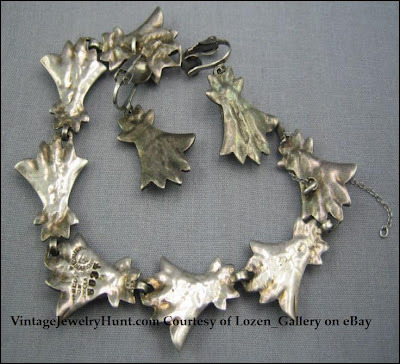 Thank you, Elizabeth of Lozen Gallery for providing me the opportunity to share this beautiful Margot de Taxco set with the readers of Vintage Jewelry Hunt! By the way, at the link above for "Margot de Taxco", there is a brooch in the same floral and enamel setting! 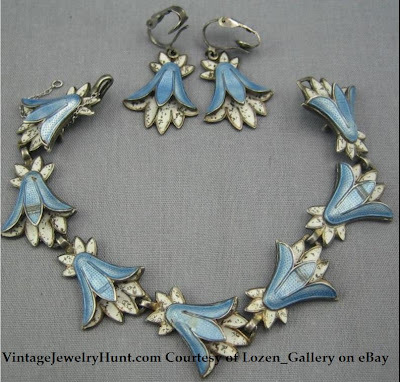 Here's a beautiful and feminine sterling and enamel bracelet and earring set from the celebrated and highly collectible Mexican silver artist Margot Van Voorhies. The bracelet is 7 3/4 inches long and the width is 3/4 inches at the widest. The earrings are clipon style and are 1 1/2 inches long including the hanger and 3/4 inches wide. The total weight is 48 grams. The bracelet is marked Margot de Taxco and Hecho en Mexico as well as the eagle 16 and the design number 5837. 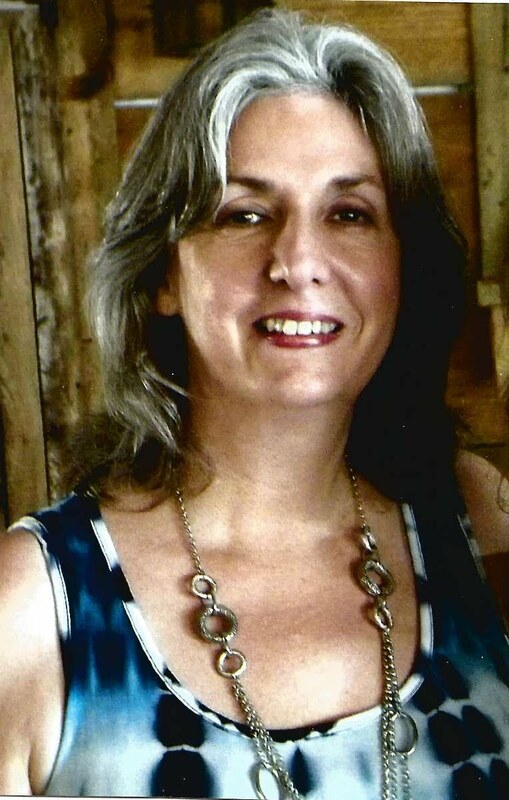 The earrings are not marked, but they are identical to the bracelet links. There are 7 petals, 4 of them have scratch marks in the enamel of the front petal, but it does not detract from the beauty of the piece. I see no enamel loss, aside from the scratch marks they are in perfect shape. This set dates to the 1950's time period. The set was auctioned for $300.00 which by all means is not over-priced for such a wonderful set! That's the great collection of beautiful jewelry product. Today many type of jewelry came in market like Gemstone beads jewelry. Do you have provide information about gemstone jewelry. Thanks for sharing this useful and precious information with us. It was great experience for me.